Growing up in Ireland in the 50's, there were certain facts that were perceived as being self-evident; the sun rose in the east, America was the land of opportunity and handball was an Irish invention. We grew up with stories of Fionn Mc Cool, Cuchulainn and other legendary heroes who, emerging from the Celtic twilight, would relax after their great deeds in battle and hunting by playing hurling (ariel hockey) and handball. Great was the shock in later years to hear that other countries such as Spain, France and Italy were also claiming credit as the original home of the game. Strict historical research, rather than myth and legend, turns up few clues as to the origins of the game. The elements involved in the play ball, wall, players and rules must have evolved in many different countries at different times. The chroniclers of ancient times would have in the main been concerned with the lives of rulers and kings; leisure activities of the people would be recorded only in so far as they touched on the lives of the nobility. The first record of ball games with the hand is from 2000 B.C. in Egypt. Their priests of the temple of Osiris in Thebes were depicted on the tombs striking the ball with the hand. 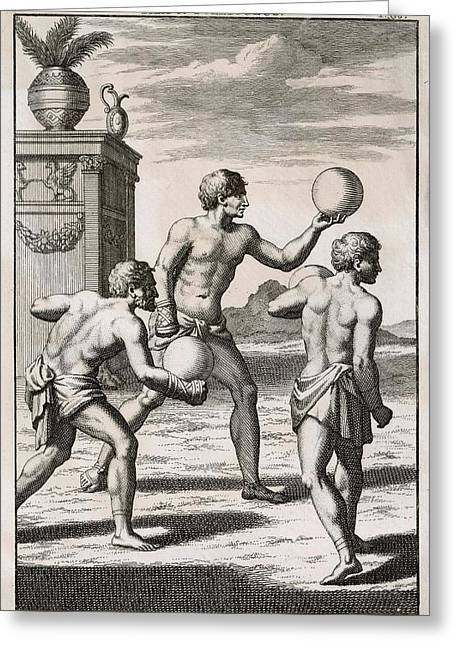 Such iconographic evidence is also found in America where ball games formed an integral part of Pre-Hispanic culture. Over 700 ball court sites have been identified from Arizona to Nicaragua. Many having sculptures, bas-reliefs and painted vessels. Showing people engaged in hand-played balls. The oldest are dated as far back as 1500 B.C., and interestingly in only one area is there play involving a wall that depicts the land of the Chichimeca people of the Mexican plateau. A one-wall game is still played in the States around Zacateca, where there are over 400 courts with most of the dimensions 12m x 6m - almost 40' x 20'. Meanwhile, back in Europe the Greek writer Homer refers to a handball game invented by Anagalla, a princess of Sparta, and describes the action in a picturesque, if not very informative way, "O'er the green mead the sporting virgins play, their shining veils unbound along the skies, tossed and retossed, the ball incessant flies." In Ireland a good server of the ball is said to have a great toss! Alexander the Great (450 B.C.) is credited with spreading the game to the Greek colonies in Italy, and from there it went to Spain, France and to other parts of the Roman Empire. Around the year 1000 A.D., as Europe emerged from the Dark Ages, mention of handball became more numerous in manuscripts. In France Jeux de Paume (palm play) became popular with both the nobility in their enclosed courts and the ordinary people who played longe-paume on common land. The medieval annul of St. Foix written around 1300 A.D. describes the game. "The exercise consists in receiving the ball and driving it back again with the palm. The game was first played with the bare hand, then with the glove, lined or unlined; afterwards they bound cord or rattin around the hand to make the ball rebound more forcibly." So far there is no mention in any of the sources of a rebound game against a wall, the game played was one of hand-tennis and this is still played in parts of Spain, France, Holland and Sweden. The original ball used was made of tightly rolled cloth pieces stitched together and this would have given little bounce against a wall. The game of Jeux de Paume with the addition of larger and longer gloves finally became the game of tennis. The hand versus racquet controversy was commented on by Erasmus the Dutch Philosopher in 1524, "You may sweat more but the game is prettier when played with the hand." About this time, play with the hand against a wall is first mentioned in Scotland in 1427, when King James I paid a heavy price for his addiction to the game. He had given orders to his men to block up a cellar window that was interfering with his handball. A short time later he found that this escape route was cut off when the assassins came to murder him: "Alas in that vault a gap once was where through the King might have fled, but three days hence closed walled had it been by his will; for the ball would run therein when without at the palm he played." Exactly 100 years later, the Town Statues of Galway of 1527 forbade the playing of ball games against the walls of the town and this is the earliest mention of rebound play in Ireland. The same laws forbade anyone with names beginning with O' or Mac to be in this English occupied town between dusk and dawn. Galway on the west coast of Ireland had many trading links with Spain especially the Basque regions where the game of Pelotamano was played and is still played extensively - it is still very much a matter of controversy as to who introduced wall handball to the other - the jury is still out. From 1600 onward, mention of handball became more numerous, in particular by church authorities who were becoming concerned with the custom of playing ball against the church walls. The churches in many European countries, fearful for their own stained glass windows, had notices forbidding play in the precincts of their establishments. Bishop Braybrooke of London in 1620 not unreasonably objected to ball play inside the church. The nobility who for a few centuries had played handball in their castles and manors were turning more and more to the racquet sports such as indoor or Royal Tennis. It became a game much played by Royalty (King Henry VIII built a court at Hampton which still survives). In London, businessmen with an eye for the main chance, built hundreds of these courts but within 100 years even the racquet game and other physical exercises went out of fashion. Card games and less strenuous activities such as theatricals and drinking became the preferred pastimes and many of the indoor courts became available for handball play. The London Advertiser in 1742 carried many advertisements, such as one inserted by Thomas Higgins for his Five Courts. "Courts may be booked by the hour or day; For handball playing until they are required for Tennis." There is much evidence that many of the players were Irish and had brought the game with them to London as they were afterwards to do for Australia and America. Many accounts of handball are given by writers of the Eighteenth Century who indicate that one-wall handball was being played in Ireland from at least 1700 A.D. The southeast of Ireland became a newsworthy area in 1798 as a result of civil disturbances during that year. Contemporary accounts list John Murphy, leader of the rebels, as a famous handballer and many of the courts were venues for meetings of his followers. The aristocracy were also supporters and players of the game. Many of the landowners gave sites for the building of courts, and the famous Dublin dandy Buck Whaley was said, for a bet of a hundred guineas ($300), to have walked to Jerusalem and played handball against its walls. There is a watercolor in Monaghan Museum dated 1782 showing a handball game being played against the walls of Castle Blaney. Irish migrants moving to England introduced the game to the English and while some one-wall play occurred, the indoor tennis courts became popular sites for handball. In these, play off the side wall became a feature -- the courts were too long for back-wall play. In London, John Cavanagh, a transplanted Irishman, as recognized as a handballer without peer. His obituary, written by Hazlitt in 1819, indicated the high regard in which he was held. "It is not likely that anyone will now see the game of handball played in its perfection for many years to come -- for Cavanagh is dead and has not left his like behind him." Returning Irishmen, as well as the English Military and police, may have brought the added feature of side walls back to Ireland. The game was encouraged among the military and in the schools of the land-owning classes. Courts with side walls were often called Fives Courts and have been identified in Wexford, Clare and Dublin. The local people, who were often excluded from these facilities, continued to play in their one-walled "alleys," often the gable end of houses and the ruins of castles and churches. Organized games were never a feature of this early era. There were no nationals, but there was what may have been the earliest pro tour. As early as 1850, players such as Martin Butler of Kilkenny and William Baggs of Tipperary, with seemingly no fixed occupation, would travel all over Ireland to play for wages against the local champions. Another feature was the fostering of handball and other Gaelic sports by the Christian Brothers and other Catholic teaching orders. Many of these men later brought the game to South Africa, America and Australia, to schools such as Duquesne University in Pittsburgh and the high schools in Butte, Mont.. Many of the handball champions of this era excelled in other sports, especially those requiring strength and endurance. Such attributes were required for matches which sometimes involved 21 games! The top player of the 1880s, David Browning of Limerick, was also a champion rower, weight thrower and boxer. He was finally defeated by American born John Lawlor in 1885, who immediately claimed to be champion of Ireland. As such, he was challenged by Phil Casey of New York for the World Title and a purse of $1,000. In the Cork Court (80' x 40') Lawlor won seven games to Casey's three, but the return in Casey's own court in Brooklyn saw Casey win the required eight games to claim the title. This meeting between the U.S. and Irish champions seemed to be the beginning of a fruitful exchange between the two countries. The interest was high and the publicity extensive, and the game got a massive boost with courts in each country turning away hundreds who wanted to view the games. But difficulty of travel, differences in courts, rules and balls, and interference by backers and promoters made it difficult to organize such challenges on a regular basis. Casey Fitzgerald of Ireland, Eagen, (sometimes spelled Egan) and James Kelly of New York were in turn recognized as World Champions. But often the title matches were unsatisfactory. Eagen's victory over Oliver Drew from Cork was marred by arguments over gate receipts and a walk out by Drew. Kelly, in his match against J.J. Bowles of Limerick, had a clause in his contract compelling the latter to serve all balls to his dominant left hand. Such controversies and bad feelings soon led to the abandonment of the series and almost 20 years were to elapse before Irish/American challenges were again to resume. This chaotic state of affairs was crying out for organization. In Ireland, the Gaelic Athletic Association attempted to bring order to the game by codifying rules and organizing tournaments. Similarly, the A.A.U., which controlled many amateur sports in America, arranged in 1897 the first official tournament between Eagen and James Dunne of Brooklyn. Eagen won this match easily and for the next nine years traveled widely in America playing all challengers for his title. The claim made by handball historians the Phil Casey's court in Brooklyn was the first to be constructed in America was disproved by John J. Condon of San Francisco. He found listings of two courts in 1873, in the directory of his native city. Condon is later noted as having played "Midge" Maquire for the World Championship in 1915 but the title designation seems to have been hype instigated by the promoters. Handball was brought to Australia by the Irish and the 1838 Act of New South Wales forbade publicans to have any ball courts in or about their hotels. The first championship was played in Melbourne in 1847 for a prize of $150 and by 1880 many championship games were covered and lit by gaslight. The 1882 champion was Keenan (NSW), who beat Eagan (Victoria), 21-8, 21-0, 21-5, 21-4, which must indicate a match of seven games. In 1883, C. Hayes won a special tournament to decide who should travel to America to play Jim Jones for the World Title, but enough funds were not available for the trip. An alley shall be 60' long (or as near as possible). For alleys with clay floors, the short line will be two-thirds of the length from the front wall -- for concrete floors it will be half way. The service will be from anywhere inside the short line. A tell board 4" high is placed at the base of the front wall and all balls must strike above this. Games are to 15 aces; matches consist of any odd number of games. Singles, doubles, or trebles may be played. Jerking (I assume catch and throwing) not allowed in championship matches but kicking the ball is permitted. A ball crossing the lines that has been played at and missed shall count against the side that missed. Balls hopping on a line shall be over that line and three shorts or long balls in serving will be a hand out. Receivers may play short or long balls if they wish. When James Kelly of N.Y. defeated J. J. Bowles of Ireland for the World Title in 1909 it was to be the last occasion for the Champions of both countries to play each other until the World Championships were inaugurated in 1964. During this period of separation the game in America began to move away from it's Irish roots and when the Americans returned to Ireland in the 70's they brought a very much changed game back with them. In this the first half of the present century the game in Ireland also underwent momentous changes influenced in many cases by emigration across the Atlantic. The rubber ball was starting to be used despite the denision of the traditionalists for the "Rubber Bag" men, the service box was introduced, matches were shortened to best of five games and back walls were built in many of the three-walled courts. The concept of handball as a game for all was not yet in vogue and most tournaments involved matches between the top players for prize money and involved much wagering. Bowles remained the target man for almost 20 years and had some fierce battles with rivals such as Cayne, Lyons, and O'Leary. Families, as they still do became involved in the game - the O'Herlikey's of Cork were heavily involved in organizing tournaments and entertaining American players. Champions from the similar game of pelota - Sastra and Dom Pedro came from the Basque regions of Spain and France and the future looked promising for relations with European handball codes. Handball was at last making some headway in Britain - Irish clergy, as they had done earlier in America, introduced the game to schools and seminaries. Irish workers on the railways and in the mines brought the game to areas such as Yorkshire, Durham, and South Wales. A photograph taken in 1906 (and featured in the 1995 ICHA calendar) shows a massive crowd watching that years three-wall final. In 1910, the School Inspectorate reported that handball was the most frequently mentioned activity in "recreation". It had become a street game widely played against any available surface and thus familiar to all the population. In Ballyporeen County, Tipperary (home of Ronald Reagan's ancestors) local historian Dan O'Donaghue reports that "everyone played handball". National Championships were still a matter of challenges and complicated agreements with the holder often reluctant (as in boxing) to put his title on the line. In the early 20's Morgan Pembroke of Dublin finally dethroned the champion Bowles with the matches being played at the height of the Independence War. The Gaelic Athletic Association founded fifty years earlier to, promote Gaelic Games began to take a more active interest in handball and helped to set up the Irish Amateur Handball Association in 1924. One of their first tasks was to arrange trials and organize competitions for that years Tailteann Games (a festival of Irish Sport and Culture). A team of Americans arrived and to the amazement of the Irish their players McDonagh, O'Donnell and Meeney made a clear sweep of the invitational events both in hardball and softball. The amateur status of the new association brought it into direct opposition with the semi-professional Irish handball Union, but the majority of players quickly transferred to the new body. The IHU continued to hold National and even World Championships up until 1936. The new association attracted the support of state bodies particularly the Army and Police - the National Police Commissioner O'Duffy encouraged his members to play and built facilities in the stations for them. Handballers became National figures and top players such as Soye, O'Neill, and Perry were featured in sports card series and other advertising literature. The Tailteann Games continued but the American players no longer attended. During the 30's Perry, Gilmartin and Hasset Brothers dominated the game. Gilmartin's record number of national titles was only last year surpassed by Duxie Walsh of Kilkenny. During the Second World War the scarcity of rubber brought a stop to softball play and the original game of hardball came back into its own. Gilmartin broke his neck in a horrific automobile accident in England during the War but still managed in 1946 to again win a National Title. Other big names from this era were Bergin, Sweeney, Rowe and Clarke. Administrators such as Matt Byrne of Wicklow, long time Secretary Martin O'Neill and a host of other helpers guided the game into the 50's when the most momentous changes in the game began. who (Bob Kendler) contributed so much for Handball in USA.